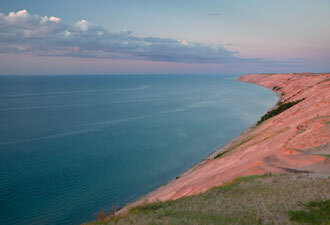 Homepage photo: The Pictured Rocks rise 200 feet above Lake Superior creating a mosaic of rock form, color and texture. Stretching more than 40 miles between the gateway communities of Munising and Grand Marais in Michigan's Upper Peninsula, Pictured Rocks National Lakeshore became in 1966, America's first legislatively designated lakeshore. The park hosts over 500,000 visitors a year seeking relaxation, challenge, recreation, solitude, and opportunities to connect with the rich natural and cultural heritage of the region. Pictured Rocks takes its name from the abundant mineral stains on the rock faces, forming images in visitors' minds. Black, orange, yellow, white and green color the 500-million-year-old Cambrian sandstone. Atop the cliffs lay remnants of the last glacial age — moraines, drumlins, and traces of ancient post-glacial river valleys where rushing torrents of sediment-strewn waters once raged. The landscape is a mosaic of multi-colored sandstone cliffs, miles of pristine beaches, numerous cascading waterfalls, sparkling inland lakes and streams, and five square miles of the Grand Sable Dunes, a designated Research Natural Area. Thirteen backcountry campgrounds provide opportunities for overnight hiking along Twelvemile Beach and the Pictured Rocks cliffs. While walking, visitors may see black bear, bald eagle or peregrine falcon or hear the yodel of loons on an inland lake. Thimbleberries, blueberries, raspberries and blackberries ripen in mid-summer, making a rest break during a hike a tasty pleasure. Human history in the park is as varied as the terrain. 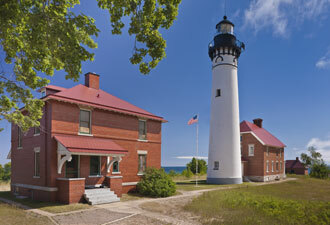 Maritime stories abound with the former U.S. Lighthouse Service’s Au Sable Light Station constructed in 1874 and the former Grand Marais and Munising U.S. Coast Guard lifeboat stations at either end of the park. A historic 36-foot, self-righting lifeboat is on display at the Sand Point headquarters. One of the best ways to see the cliffs is from the Pictured Rocks Cruises, the park's authorized tour boat concessioner. The two and a half hour trip traverses approximately 15 miles of shoreline, sharing spectacular views of cliffs that rise up to 200 feet and dashing waterfalls. The lakeshore, open year-round, is a four-season destination where you'll find excellent opportunities for hiking, camping, kayaking and canoeing, backpacking, skiing, snowshoeing and snowmobiling. 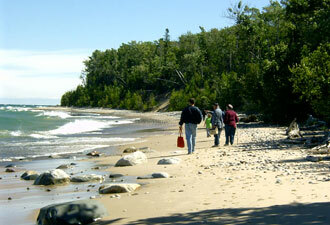 Plan your visit to discover a wild beauty on the Lake Superior shore.